The Oxford Centre for Hebrew and Jewish Studies has announced that it will be moving in 2014 into accommodation in central Oxford. The move from its premises in Yarnton will enable the Centre further to integrate into the University the Centre’s teaching and research, and will provide a new base in the city centre for the Centre’s outreach to a wider public. 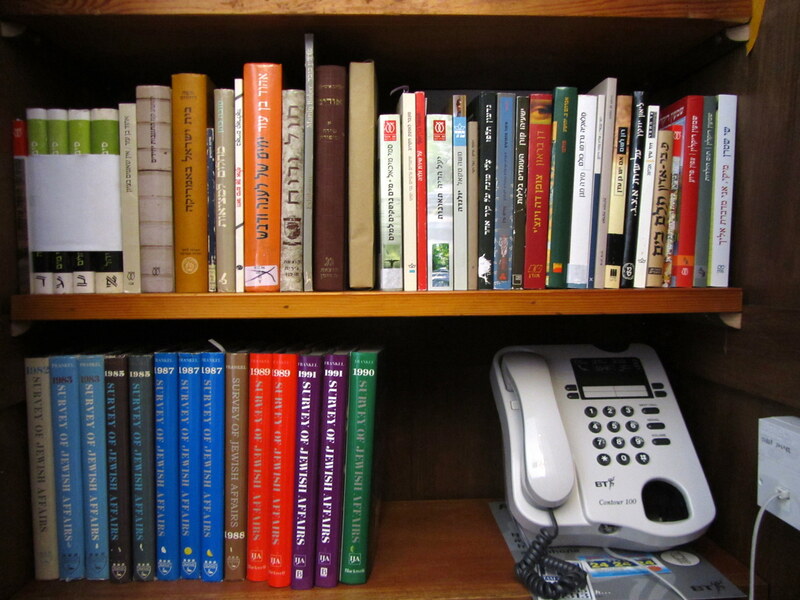 The move will greatly benefit the operation of the international research groups convened by the Centre under the aegis of the Oxford Seminars in Advanced Jewish Studies, providing these researchers with office space closer both to those teaching in Jewish studies and related fields in the University and to the resources of the Bodleian Library. The initiative has been warmly welcomed by the University and by Lord Fink and George Pinto, CoChairmen of the Governors of the Centre, as a reflection of the close relationship which has developed between the Centre and the University, of which it is a Recognised Independent Centre. It is expected that the confidential discussions currently in train between the Centre and the University about the city centre location of the Centre’s new accommodation will be completed early in 2014, and an announcement of the location will be made then. This entry was posted in Uncategorized on 21 November 2013 by zeidlerm. Grab a magnifying glass and peep in to an eighteenth-century printing workshop! 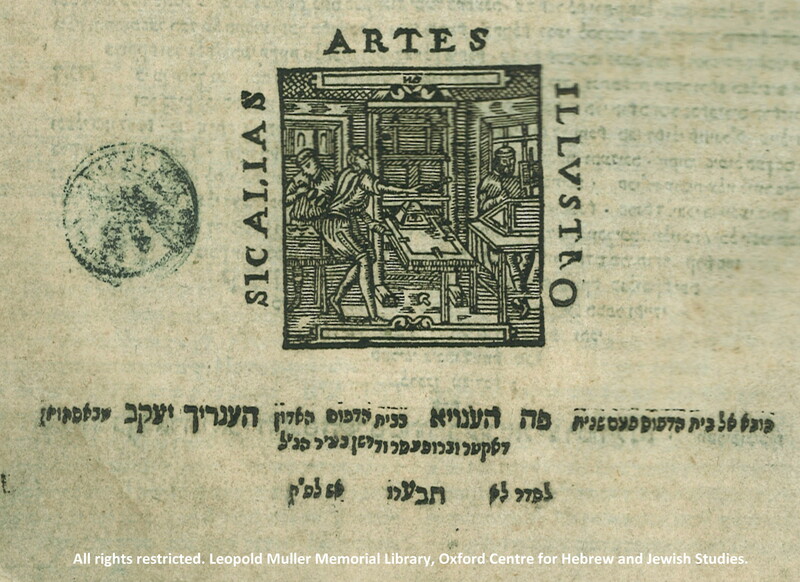 This detail is from the title page of Kikayon Yonah by Jonah ben Isaac Teomim (1712), and shows the printer’s device through which we can peep in to an eighteenth-century printing workshop. The device belongs to a Calvinist theologian and Hebraist, Heinrich Jacob von Bashuysen, who established a Hebrew printing house in Hanau in the early 1700s. More than one hundred works were published here, many of which was written by Bashuysen himself. This entry was posted in Uncategorized on 20 November 2013 by zeidlerm. 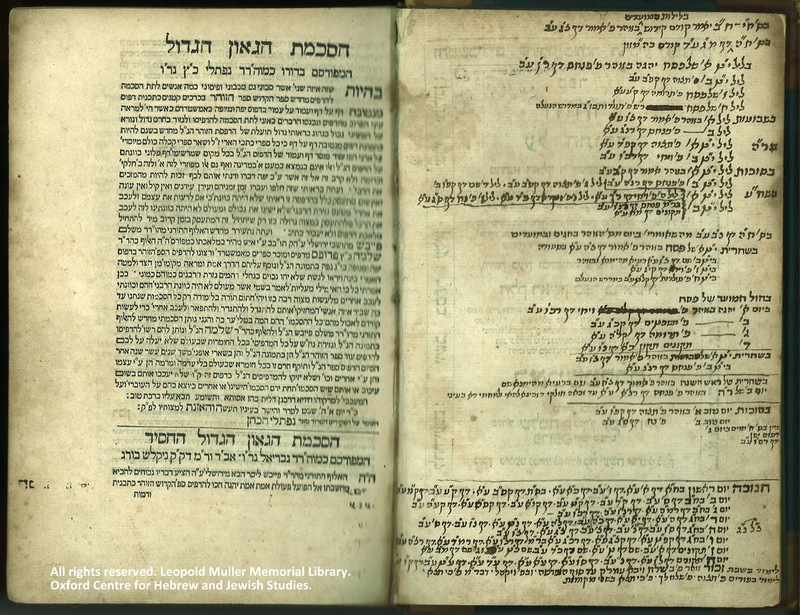 The highlight of the week is a two-volume 5475 (1714 or 1715) Amsterdam edition of Sefer ha-Zohar, pre-owned and signed by D. L. Pereira (David Haim Pereira). Notice the date in the chronogram converted and transcribed by hand “Año 5475”, very likely the same that signed the title page. The book is heavily annotated. Below is an image of the title page verso containing notes on festivals. Marginal notes are interspersed throughout the rest of both volumes. 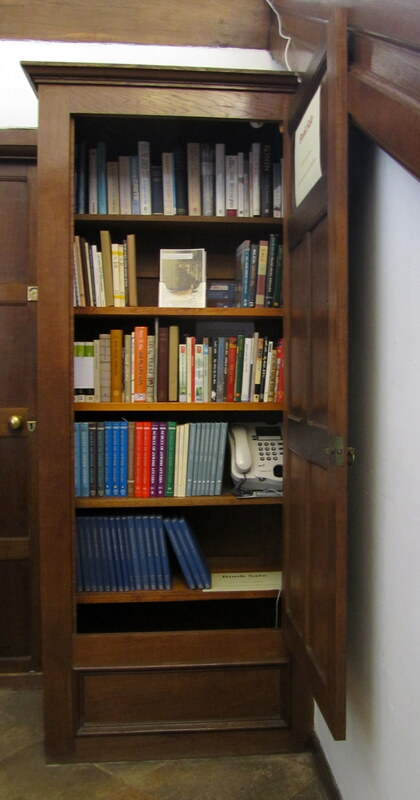 The books are part of Sir Moses Montefiore’s library, previously held at Ramsgate in Kent and Jews’ College in London, now with us as part of the Foyle-Montefiore Collection acquired in 2006. 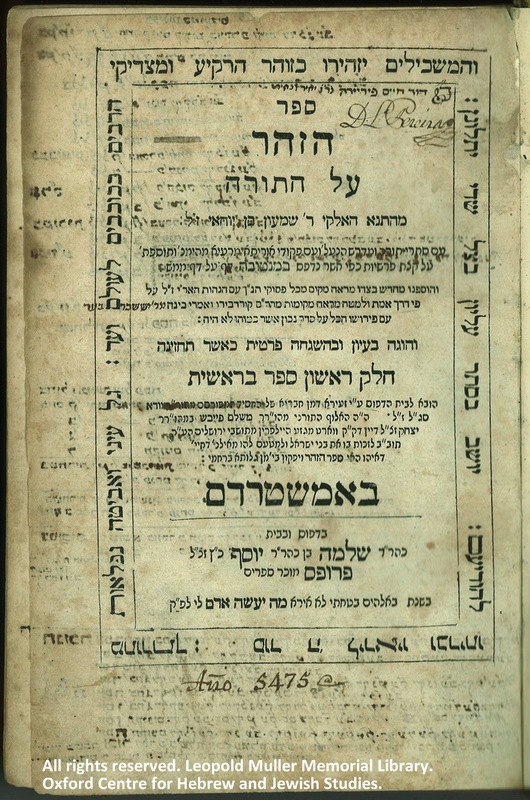 Both volumes were rebound at some point in the 19th century, and their front boards adorned with an oval gold-stamp decoration of Yeshivat Ohel Mosheh ve-Yehudit Ramsget. 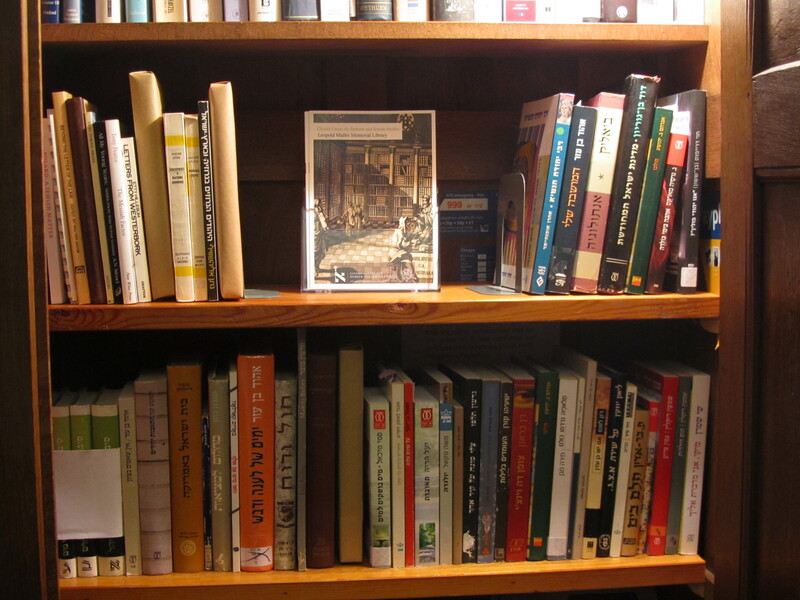 It is not clear how this early 18th century edition of Zohar found its way into the library of Sir Moses Montefiore. 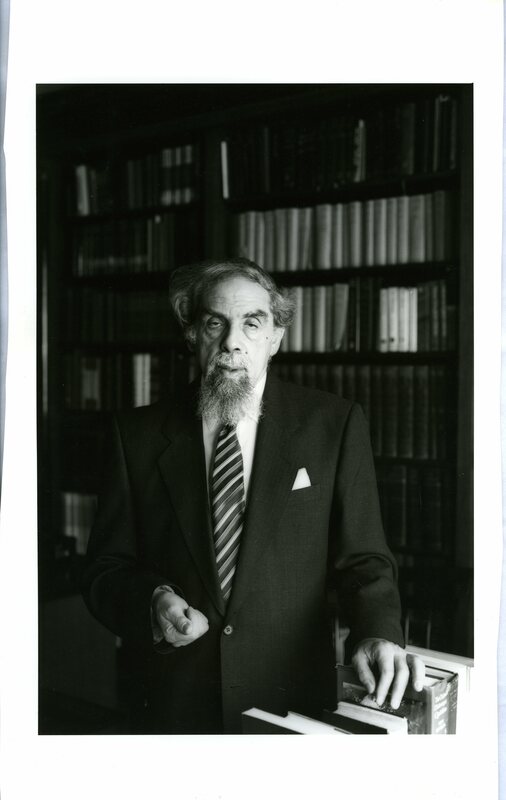 The previous owner of Sefer ha-Zohar, D. L. Pereira, David Lopez Pereira, otherwise known as David Haim Pereira, spent the later years of his life in Saint Mary Whitechapel, Middlesex. If identified correctly, he was the son of Manuel (known also as Isaac) Lopes Pereira and a grandson of David Lopes Pereira (Duarte Lopes Pereira) of Almendra, Portugal. 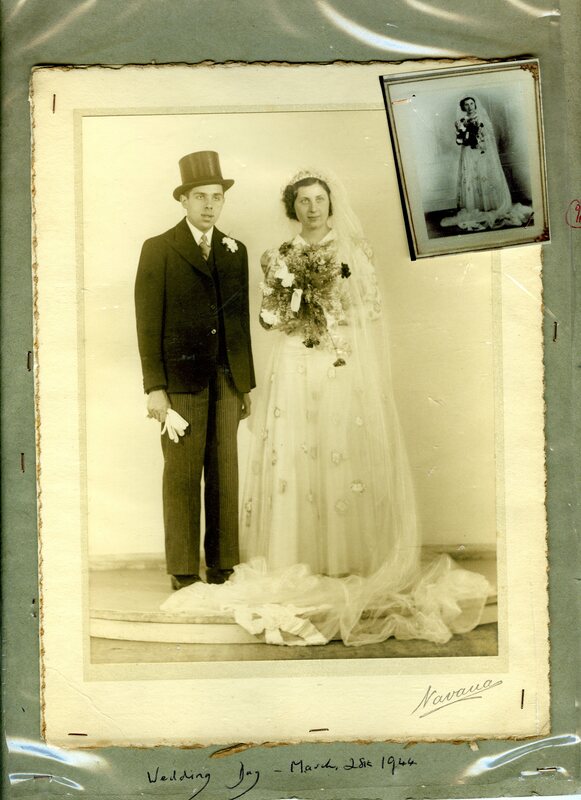 The history of the Pereira family is fascinating. In 1629, D. L.’s grandmother Francisca was prosecuted by the Spanish Inquisition at Avila, and survived the ordeal. The family then subsequently moved several times to and within Holland (Rouen, Antwerp, Middleburg), lived at some point also in Bordeaux, France. In 1655, they arrived in London, where Manuel (Isaac) Lopes Pereira has become a treasurer and then also a warden of the London Congregation, gradually acquiring stock in sea trade companies and local banks. D. L. Pereira, it seems, inherited parts if not all of this, and is mentioned in Farber as one of the Jewish investors in the Royal African Company (engaged in transatlantic slave trade), and the Bank of England, 1702-12. To some, it might be of interest to know that his Will (17 March 1756) is held at the National Archives in Kew, and available for download at a small fee. Eli Farber’s Jews, Slaves, and the Slave Trade: Setting the Record Straight (NYU Press, 1998), p. . On the Jewish involvement in transatlantic slave trade focusing on the British empire. 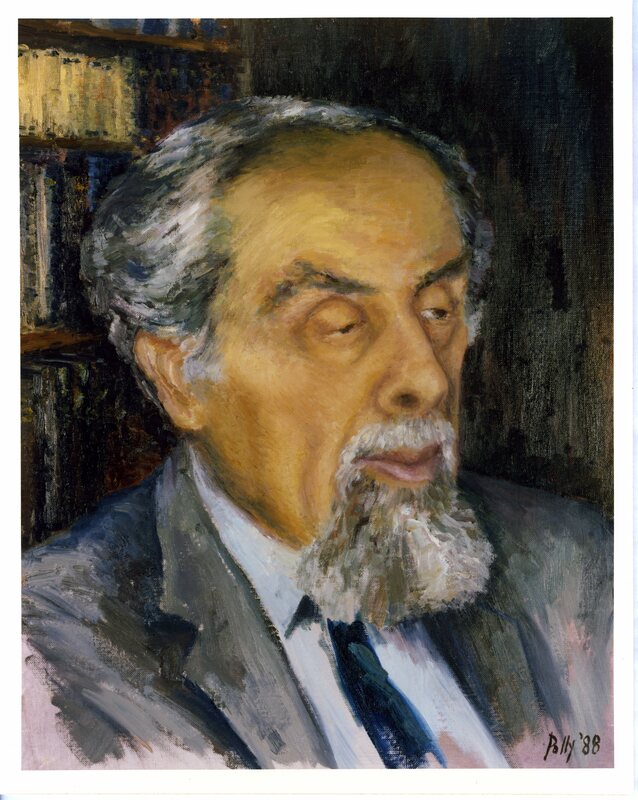 This entry was posted in Foyle-Montefiore Collection, Highlights and tagged Bank of England, D. L. Pereira, Moses Montefiore, Royal African Company, Zohar on 6 November 2013 by zeidlerm.